Mediterranean Cooking with Clifford A. Wright: What do I do with Kale? In the Mediterranean kale cries out for soup. 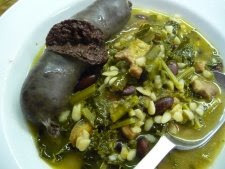 In northern Italy a very nice black kale soup is called minestra di cavolo nero e fagioli. It uses a dark leafed kale, a hearty leafy vegetable in the cabbage family, called black kale, Russian kale, or Tuscan kale. I like it with blood sausage. Cook some chopped onions, carrots, garlic, pork belly pieces or pancetta and a four-inch-square piece of pork skin in some olive oil until soft. Add some red kidney beans, maybe 1/2 cup, and about a pound of kale cut into thin strips, and cover with 6 cups of chicken broth. Bring to a boil then reduce the heat to very low and simmer until everything is very tender, about 4 to 5 hours. An hour before serving you can add 1/4 cup of soup pasta such as semi di melone. Season with salt and pepper at the end. Cook the blood sausage separately in barely simmering water.